T.code FTXP is used to create Tax code. All the Taxes are divided into two categories. Input tax: All taxes related to purchase are considered as Input tax. 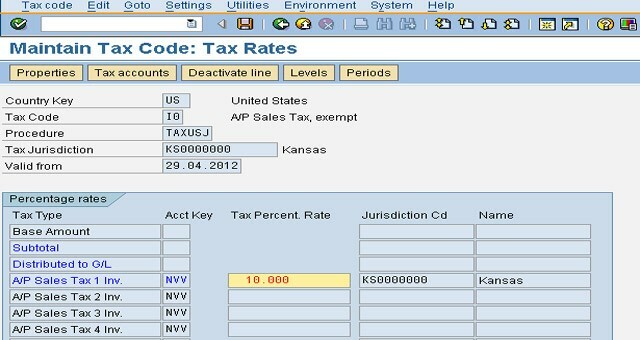 T.code FTXP is used to create both input or output tax code. 1. Go to T.code FTXP, and select the country for which you want to create tax [IMG - Financial accounting - Financial accounting global settings - tax on sales/purchases - basic settings - Assign country to calculation procedure]. Indicator which determines that an error message should be issued if the tax amount is not correct. It is recommended to flag this. Eu code: Set this parameter at "1" it represents all the Sales from one EU country to another EU country. If you do not set this parameter at "1" then all transactions with this code will be not picked up in the ESL listing of that specific country. Reporting country: this field needs to be completed when you are using the plants abroad functionality. This means that when you as a German company have a Belgian VAT number and you have sales in Belgium (+ you need to submit a VAT return in Belgium), then ofcourse these invoices need to be booked in SAP with a Belgian tax code. 3. Now in the Menu allocate the amount where this specific tax code is used to a certain tax account. The tax type fields such as Base Amount, Input tax, Output Tax ... can be determined via the calculation procedures. Calculation procedures are defined in the IMG [Financial accounting - Financial accounting global settings - tax on sales/purchases - basic settings - Assign country to calculation procedure]. Non-deductable: Used JVRN for Non-deductable. For VAT, Go to FV12, select JVRN or JVRD as per our requirement .....select Tax Classification..... maintain the % of the VAT. Deductable: Used JVRD for a deductible. GL accounts has to be assigned under OB40 for automatic posting of tax amounts.